How far are the 'Saddle Off' projects from Chiang Mai city? The travel time to the projects that are situated to the north and south of Chiang Mai city is between 1.5-2 hours. How many elephants are there at the 'Saddle Off' projects? 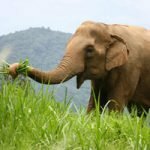 Most projects have between 2-7 elephants with the exception of the Elephant Homestay Khun Chai Tong in Surin which can have up to 20 elephants. How many people are in the group visiting the 'Saddle Off' projects? The group size for single & half day tours at our ‘Saddle Off’ projects is limited to a maximum of 12 guests, with the exception of Elephant Freedom & Elephant Trails, which may have up to 24 guests. We aim for there to be no more than 3-4 people per elephant. At projects offering volunteering, where there are larger herds of elephants, the number of guests may be higher. Can you collect us for the tour from our hotel / guesthouse? Yes, as long as you are staying relatively close to Chiang Mai city we will pick you up in a minivan from your hotel or guesthouse and transport you back there at the end of your tour. If you are staying out of town (outside the middle ring-road) additional charges apply. Please advise us on your reservation form. For volunteer projects located in Surin, please see details specific to your project. Which projects are suitabile for familes with young children? 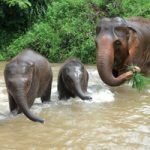 The projects with day tours that are suitable for families with young children under the age of 7 are Save Thai Elephant Park, Elephant Trails & Karen Elephant Retreat in the North of Chiang Mai as well as Karen Elephant Serenity and Elephant Freedom in the South of Chiang Mai. What are the rates for adults, children and infants? Adults and children over 12 years pay full price. Children aged 2-12 are charged at half price. Infants under the age of 2 are free for projects that are suitable for all ages, provided that they do not occupy a seat in the minivan. This is covered under the Booking Policy. What bags / luggage can I take with me? Generally, singe day ‘Saddle Off’ projects allow guests to bring one day pack, and volunteer projects allow one standard check-in sized backpack / suitcase & one day pack per person. Please see individual project descriptions for further details. What happens if it is raining on the day of my tour? All of our ethical elephant tours will still go ahead if it is raining. Elephants love the rain and ponchos / umbrellas will be provided in the event that it is raining on the day of your tour. What food is served at the 'Saddle Off' projects? All tours provide freshly prepared vegetarian buffet style food. If you have any special dietary requirements, please advise us when making your booking. 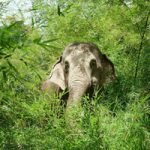 What is the difference between visiting Elephant Nature Park and one of the 'Saddle Off' Project tours? 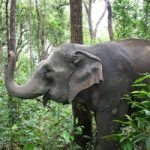 The ‘Saddle Off’ project tours are small independent operations working in cooperation with Asian Elephant Projects which is run by the team from Save Elephant Foundation & Elephant Nature Park. At the projects there are usually between 2-7 elephants and most allow only single day or half day visits, with a few offering one week volunteering. 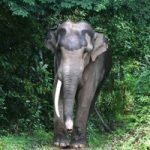 At Elephant Nature Park there are over 70 rescued elephants living in different herds, including several elephants that were born at the Park. 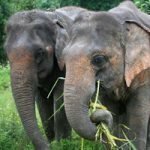 ENP offers day visits, overnight stays and one week volunteering, and is often booked out for weeks or months in advance. All visitors and volunteers are covered by our accident insurance, however we recommend that you have individual travel insurance. Guests volunteering at projects for a week or more are required to have travel insurance. We suggest that you consult your doctor or a travel vaccination centre prior to travel for advice. Is it possible to change the dates of my visit? Yes, provided there is availability. A fee will be incurred if you change your booking less than four days before the start date of your tour. Is it possible to change which project I want to visit or volunteer at? Yes. To do this you need to cancel your existing booking with us and make a new reservation. Please refer to our terms and conditions for further details. Can I pay my remaining balance online? No, we ask that you pay the balance in cash in Thai baht or US dollars at our office in Chiang Mai no later than 3pm on the day before the commencement of your tour. The only exception to this is if you are volunteering in Surin or in Cambodia, in which case, you can pay at the project on arrival. Please see our Terms and Conditions. This is covered under the Booking Policy. What happens if I have to leave my volunteer week early? Unfortunately, if you leave a project early you are not entitled to a partial refund for unused time as we have already committed to the allocation of resources for your stay. The use of any details you provide us are for contact or booking purposes only. We will never sell or share your personal information with a third party unless required by law. Can I fly my drone to take video or photos? The use of drones at projects is strictly prohibited. It is illegal and scares the elephants.